Sorry to hear that the Long Blondes have disbanded. An early favorite of DCRC, they put on a killer show at the RNRH in June of 2007, and a slightly less impressive, yet solid show at RNRH in May of this year. Hopefully Kate Jackson will continue on in some rock fashion. Apparently she will. Best wishes to ailing guitarist Dorian Cox. 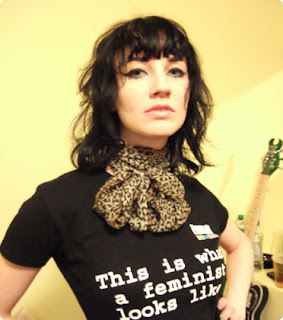 I am a feminist, too, and I don't look anything like that girl. i have that t shirt. mine's pink. Interesting to see that the shirt in the pic is the most notable aspect of this post. It was a bit buried under the links, but the guitarist had a stroke...in case that was of interest. He's not old or anything, either. But yes, interesting shirt. I think it looks good on her. The shirt, and I didn't know that Kate Jackson joined a rock band after she left CHARLIE'S ANGELS. isn't this a fashion blog? rock band. more like rack band.